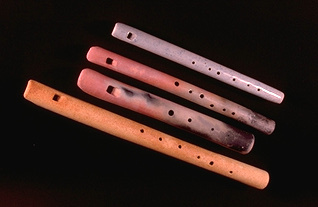 Ceramic flutes and whistles have been made by many cultures for thousands of years. The Native South and Central American peoples developed this craft to such a high degree that even todays musical acousticians have a difficult time explaining some of the complex acoustical designs of their vessel flutes. My designs for clay ocarinas and flutes bring nothing new to this tradition, as far as I know. However, I have had a good time creating unusually shaped flutes, pursuing a goal of shaping the flute in such a way that the finger holes fall more naturally under the player's fingers. Most of these instruments are in some sort of a modified "S" shape. 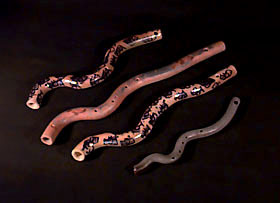 Shown above is also a vessel flute, styled after a Chines "xun". 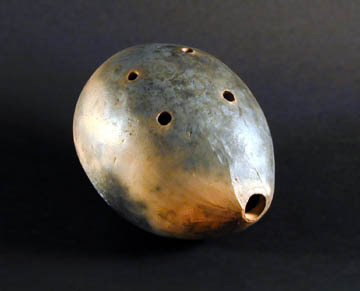 This is a predecessor of the more modern ocarina.